On the eve of America's entry into World War II, TIME magazine reported that to the German masses the United States meant "sky-scrapers, Clark Gable, and Artie Shaw." Some 42 years after that, in December l983, Artie Shaw made a brief return to the bandstand, after thirty years away from music, not to play his world-famous clarinet but to launch his latest (and still touring) orchestra at the newly refurbished Glen Island Casino in New Rochelle, New York. Oddly enough, New Rochelle isn't all that far from New Haven, Connecticut, where Artie Shaw spent his formative years and at an early age became a compulsive reader, and where at 14 he began to play the saxophone (and several months later the clarinet), and at 15 left home to play all over America. Shaw could scarcely have known that within a short time he would make a hit record of a song called Begin the Beguine". 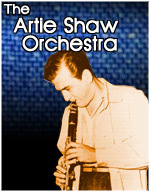 Shortly before that he had hired Billie Holiday as his band vocalist (the first white band leader to employ a black female singer as a full-time member of his band), and within a year after the release of Beguine, the Artie Shaw Orchestra was earning as much as $60,000 weekly-a figure that would nowadays amount to more than $600,000 a week! The breakthrough hit record catapulted him into the ranks of top band leaders and he was immediately dubbed the new "King of Swing". Today, Shaw's recording of Begin the Beguine sells thousands and has become one of the best-selling records in history. Superstardom turned out to be a status that Shaw (as a compulsive perfectionist) found totally uncongenial. Within a year he abruptly took off for another respite from the music business, this time in Mexico. In March of 1940 he re-emerged with a recording of "Frenesi", which became another smash hit. For this recording session, he used a large studio band with woodwinds, French horns, and a full string section along with the normal dance band instrumentation-another first in big band jazz history. Later that year he formed a touring band with a good-sized string section, with which he recorded several more smash hits, among them his by now classic version of Star Dust, plus a number of other fine musical recordings such as "Moonglow", "Dancing in the Dark", "Concerto for Clarinet", and many others.